If asked to name the smallest country in Africa, most people would not be able to. They might guess Swaziland or Lesotho but they would be wrong. 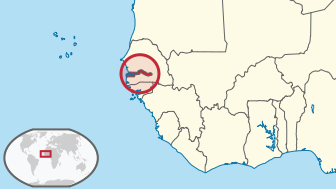 It is "The Gambia" which stretches along The Gambia River, surrounded on three sides by Senegal on the West African Bulge. Some of the island nations surrounding Africa are smaller but it is the smallest on the African mainland. Today I made a short airport stop in Banjul, the country's capital and caught glimpses of pretty much the entire country as we descended. Not exactly a household name, The Gambia has a tragic but interesting history. It is a relic of the Slave Trade with Portuguese, British, Americans, Arabs and even Africans buying and selling slaves here. It has a population of about 1.2 million living on slightly more 11,000 square meters. The country gained independence from Great Britain in 1965 with Banjul having formerly been Bathurst. With excellent beaches, a major river and fertile soil, the Gambian economy has a good economic base for farming fishing and tourism. I was impressed with the airport for such a small, developing country and several large planes from Europe were parked on the tarmac. Here are a few links providing more information on The Gambia and on other small African countries. I will spend tonight in Dakar, Senegal and fly on tomorrow to my next working stop in Praia, Cape Verde, another small country few people have heard of. I'll post something on my blog on this country in a couple of days.